On screen: Mayor Sharon Konopa is flanked by Manager Wes Hare, left, and Attorney Jim Delapoer. 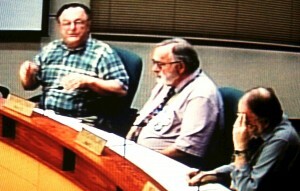 It’s not exactly HD; Councilors Rich Kellum, Ray Kopczynski and Floyd Collins, from left. Suppose you’ve been to the dentist on a Wednesday afternoon and don’t really feel like sitting through an Albany City Council meeting that night. But you don’t want to miss out on the fun, so you tune your old TV to cable channel 23 at 7:15 and watch the proceedings there. And as the council chugs through its agenda for the night, you can think of some things that would make these telecasts easier to watch. First, though, you are grateful that the city makes this TV effort at all. You don’t want to sound like the guy who watches a poodle reciting the Declaration of Independence and then complains about the dog’s French accent. Still, it would be nice if council members were mindful of the audio aspect of the broadcast. That would mean they would always talk close to and into their microphones, the way Councilor Bill Coburn did the minute this was written, so that all their remarks would come across. It would also be helpful if the picture went along with what you hear. Sure, you realize that the cameras are stationary, and there are no camera operators to zoom in on the action. Still, if planner Anne Catlin is talking to the council from one side of the council table where staff members sit, it would be nice for the camera aimed at that part of the room to be switched on. I’m chuckling as I read your post. I find it much more convenient to view the meetings online via my computer and HD monitor. My wife refuses to join me, so channel 23 on the big-screen HDTV is not an option. Lately, I’ve resorted to waiting for you, or the D-H, to report on the proceedings. The quality of reporting is so good that I get to kill two birds with one stone. I now enjoy watching Survivor with my wife, and getting a great re-cap within hours of meeting adjournment. This sure beats physically sitting through a council meeting that is 99% boredom, and 1% stimulus (especially comments from the public and council). I probably won’t be attending many future council meetings in the future as a result.